Could Google Data Studio Benefit My Business? Google Data Studio, the platform that turns data into informative, well-structured and visually engaging reporting dashboards can support your company in making better business decisions. The launch of Google Data Studio means that Google is edging ever closer to achieving its mission; to organize the world’s information and make it universally accessible and useful. This new data visualisation and reporting platform was launched in June 2016 and the industry leader tech giant has been constantly improving and fine tuning its offerings ever since, by releasing technical and functional updates of the program. Google Data Studio is a platform that turns data into an informative, well-structured reporting dashboard which is visually engaging and easy to understand. By making these dashboards Google is aiming to support organisations in making better business decisions. Why is Google Data Studio useful for businesses? One of the big challenges for corporations is that their data is often spread amongst different people or companies, and it can be difficult to bring those siloed data sources together in order to gain a comprehensive insight. The Data Studio supports collaboration by allowing different teams or individuals within one team to view, edit or add to the dashboards, negating the need for countless email exchanges and addressing the issue of multiple versions of spreadsheets living in multiple inboxes. Moreover, Data Studio uses pre-built data connectors that enable raw data to be transformed quickly into impressive charts and graphs by allowing you to easily connect to different data sources in the same time without the need for coding knowledge. 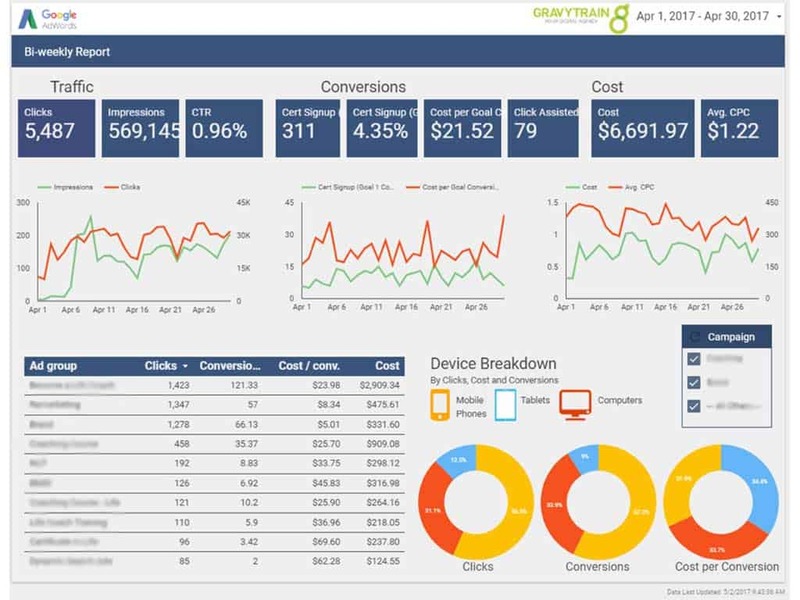 For example, you can combine Google Analytics data and Google AdWords data into one single, visual report. Once the visual dashboards are created, you can add control elements to these reports to make them interactive and more insightful. It allows readers to dynamically segment, change, tailor and refresh their dashboards based on their preferred selection, losing the rigid nature of the other forms of reports that a user or client normally sees. How much does Google Data Studio cost? The only initial difference between the free Google Data Studio and paid Google Data Studio 360 version was the limitation of the number of reports which was set to 5 in the free version. However, Google lifted this limit in February 2017, and we are now allowed to create as many stunning dashboards and connect to as many data sources as we want for free. Nowadays, the only limit is our imagination. Companies often struggle to combine, understand and gain actionable insights from data that they own, which can hinder business development and decision making. Data Studio helps make sense of this data, and present it in a clear and concise way. Want a hand creating your very own interactive dashboard? Get in touch 020 3627 1970 with the Gravytrain team to find out how we can help your business blossom.